On November 18th & 19th, TEC and Magic Aire hosted a booth at the Illinois Association of School Administrators & Illinois Association of School Boards 2016 Joint Annual Conference Exhibition. 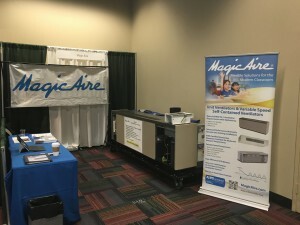 The booth exhibit featured the unique self-contained unit ventilator which incorporates packaged cooling and heating into a single unit, thus eliminating the added cost and maintenance for adding a remote condenser for cooling. The unit has the highest part-load efficiency ratings in the industry due to a true variable speed compressor, as opposed to a 2-stage compressor like that of competitors. The sound is also a full 7 dB lower than older Magic Aire units. Models range from 2 to 5 tons and can include water, steam, electric heat or hot gas reheat. Models for 2017 include air and water source heat pumps. School board members, facilities managers and engineers visited our booth and had the opportunity to appreciate this quiet and efficient unit.